Driving a motorhome is easier than expected. If you are used to driving a car, and know the differences when driving a motorhome, you’ll be fine. Don’t drive too fast, and give yourself plenty of extra space. 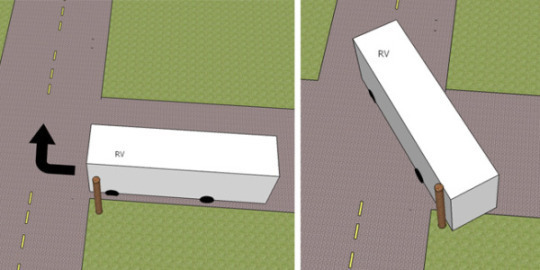 A lot of people lose perspective when driving a motorhome, which is big, wide and long. The first time can be frightening, but it doesn’t have to be. The average motorhome is almost one meter wider than the average car. If you are used to driving towards the center of the road, you might find yourself crossing. Be aware of this extra width. To fix this, teach yourself to drive a bit closer to the pavement than you normally would. Start by doing so in your own car, to get used to the space, and then slowly move to the motorhome. 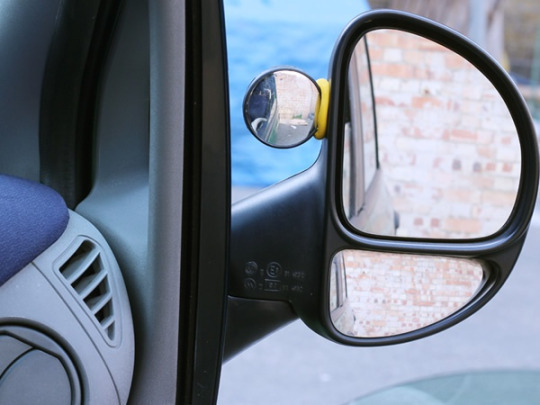 Before driving your motorhome, adjust the wing mirrors until you see a quarter of the the vehicle’s side. In this position you should be able to see where your vehicle is placed on the road. Remember to frequently check if you are staying inside your lane. When turning, the back wheels shouldn’t match the direction of the front ones as they take a shorter route. With longer vehicles, such as motorhomes, it can make a difference. If turns are done incorrectly, the back wheels could hit the curb, resulting in the vehicle losing balance. To prevent this, keep an eye on curbs, road signs or any other objects. Turn the steering wheel in the desired direction, and keep an eye on obstacles such as the curb. If you come too close to any of these, straighten for a moment till you are passed it, to give more room, and then continue to turn. If it is a sharp turn, you can turn the steering wheel in the other direction first to create a large circle. 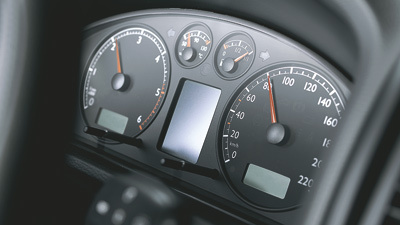 Drive slowly, and use your indicators well in advance (as you should always). 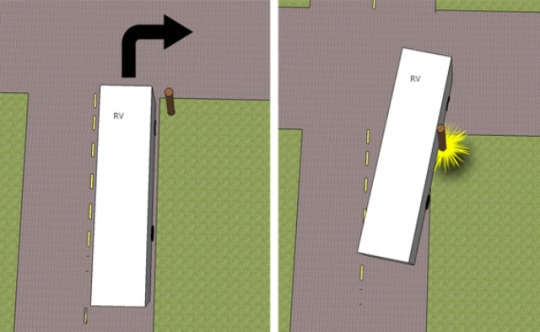 While the middle of the motorhome goes into the same direction as the front, the back of the motorhome will pivot to the other side. How much it will pivot depends on the length of the part behind the back wheels. This can be around 1,50 meters, so that means that quite a sizeable amount is pivoting. This is important to think about if you drive away from spots where there are obstacles in the way and you have to make sharp turns, such as parking spots or petrol stations. If there are obstacles in the opposite direction, drive straight through until the back wheels passed these obstacles. Take a slow turn and have an eye on the obstacles through the mirrors. The idea is is to make broad arching turns, not sudden and sharp ones. Every time when parking your vehicle, think about how you are coming out of the parking spot. If that would mean you will have to make a sharp turn, make sure there is enough space for the back that turns into one direction and the middle that goes into the same direction. Try to avoid tiny parkings, especially if they include possible obstacles. It is always handy to have someone who can give instructions in situations where the driver has a bad view on obstacles. Teach yourself to gain trust in using the mirrors. Looking over your shoulder or using the rearview mirror does not work with a motorhome. You have to make use of the side mirrors and the death angle mirrors. Do not just trust your rearview monitors. Mostly those are focused downwards and may miss obstacles higher up. Motorhomes that drive backwards are comparable to cars. Your mirrors are placed the way you can see the sides of the vehicle including the bumper. Heavy vehicles need more time to break than lighter vehicles. How much time depends on different factors, but the most important one is the speed that you can decide on yourself. Lower your speed. With this you also save money on gasoline. Increase the headway. The best way to prevent accidents is to increase the distance between yourself and the car in front of you. Another advantage of driving slower is that gaps arise between yourself and the vehicles in front of you, giving room for other drivers to move past you safely. Check your mirrors (and eventually the rearview monitor) before changing to another lane. Use your side-turn signal lights. Check your mirrors a second time before you change the lane. Driving a motorhome is easier than you think. With the correct insights and the right driving techniques you ensure safety while driving relaxed to your next destination.